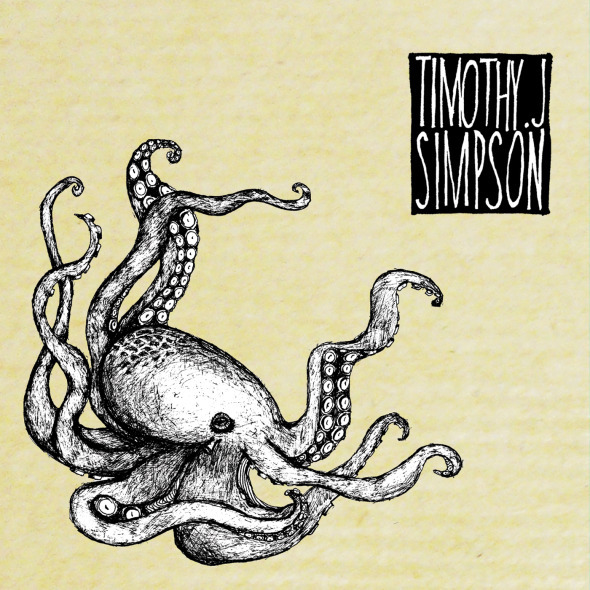 Through blindness, compulsion and bile, we introduce the new album from Timothy J Simpson. From Nottingham, England, Timothy J Simpson picked up a guitar at 12 years old and has since played punk, funk, and odd electronica, before rejecting the whole lot for music that he can make with just his hands, his voice and the words in his head (some would say voices). His songs are mostly skewed kitchen sink tales about modern morality, the individual's place in society and the crushing inhumanity of the workplace. Naturally his sound is tinged with cool accents of Blues and Americana but mostly prevails by its memorable arrangements and melodies, not to mention his particularly fierce skill on the guitar. Firstly they started recording in London, finding themselves in Hackney, smack bang in the middle of the riots in 2012 - not the place to be when you’re carrying a microphone worth £1500 (for the record it was rented, not looted). The sessions provided the backbone for much of what followed and the band continued to record while wowing crowds at gigs, sharing stages with local luminaries such as Jake Bugg, Injured Birds and Baby Godzilla alongside touring acts such Jon Allen, Paul Kelly and Chuck Prophet. Despite this success, the ongoing album sessions were plagued by bad fortune. Guitarist Marq perplexed and baffled the medical world when he began to suffer from periodic spells of unexplained blindness, while bass player Laura ended up laid-up after going under the knife to get her nose pipes re-drilled. This bad luck was compounded when Lizzie broke her kick drum leg just days after recording the last track on the album, which the band took as a gesture of fate, despite the trauma it caused. Anxiety has always been a theme throughout Tim’s work but these concerns, along with worries over his continued employment in austerity Britain, mean that the finished ‘Oh, These Endless Fears’, is a conflicted album which underpins flippant songs about marriage and lust with metaphorical yet omnipresent dark forces of unemployment, compulsion and fear, with the human voice either softly resigned or howling in futility, clawing towards the light. The band are touring the release in February 2014 – dates to follow soon.